A dark dungeon or a middle school classroom – both can be prisons until the right fairy tale magic opens all the doors. One story sends a brother and sister questing through amazing lands where courage and cleverness may unlock the secrets to save a kingdom and their lives. Conner and Alex loved Dad’s stories, like the legend of the Curvy Tree and the tale of the Walking Fish. Since he was killed last year in a car crash, it’s been rough for the twins and their mom. When Grandma gives them the family’s special storybook for their twelfth birthday, Alex reads herself right into the Land of Stories, and her brother has to jump in after her! A talking frog who collects books, a gingerbread house in the woods, the three Charming brothers (formerly princes, now kings) – all the tales that the Baileys grew up hearing are real and true here! But now Goldilocks has grown up to be a swordswoman and wanted fugitive, the Big Bad Wolf’s family has vowed revenge on self-obsessed Queen Red Riding Hood, and Queen Cinderella is expecting a royal baby any day now. If they ever want to see their mom or their world again, the twins will need the rare Wishing Spell. Luckily, Froggy had found a handwritten journal outlining the items needed to create the Spell, sending Conner and Alex through all the kingdoms of Happily Ever After to find them. Alas, the Evil Queen has escaped from Queen Snow White’s dungeon with the magic mirror and will stop at nothing to have the Wishing Spell for herself! Will the twins be able to acquire everything for the Wishing Spell? Can they escape troll caverns, goblin prisons, and over-talkative travel companions? Is the Big Bad Wolf Pack still on their trail? And what did the journal-writer wish for when he completed the first Wishing Spell? First in a new series, this adventure story introduces new-to-us fairy tales along with intriguing what-happened-later versions of familiar classics. 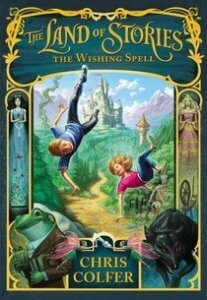 This book is a fantasy its about twins who travel to another world that their dad lived and they must find objects from famous fairy tale characters to create a spell to defeat the evil Queen. I love this book because it has adventure and its about family.